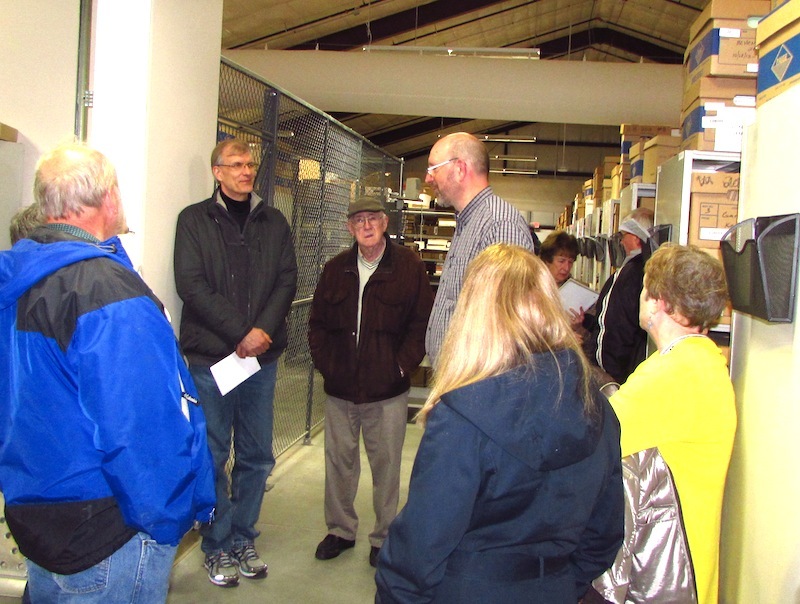 County Records Manager Bill Draths led a tour of the county records storage building in Hartland Township March 23 for members of the McHenry County Joint Council of Historic Groups. 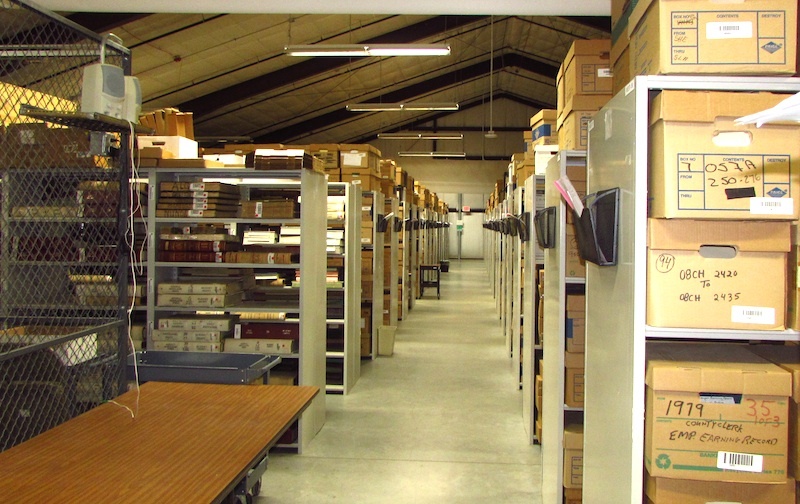 The 1,500-square-foot building, now at about 85 percent capacity, holds 18,000 document boxes – each 1 cubic foot. Its steel shelves also provide for flat storage of large bound items. Everything is identified by a barcode, which corresponds to a particular shelf and box. "Say what you want but the stuff lasts," Bill said, "especially old paper." 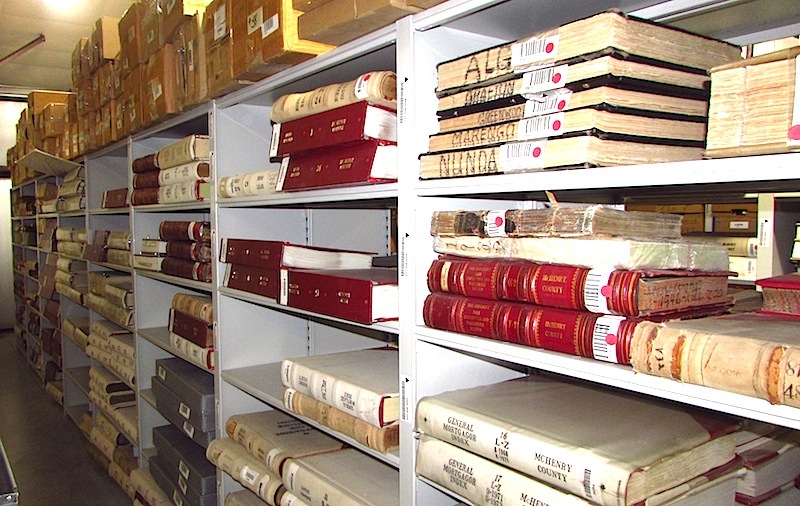 Among the items the facility must store permanently are land records and court documents. 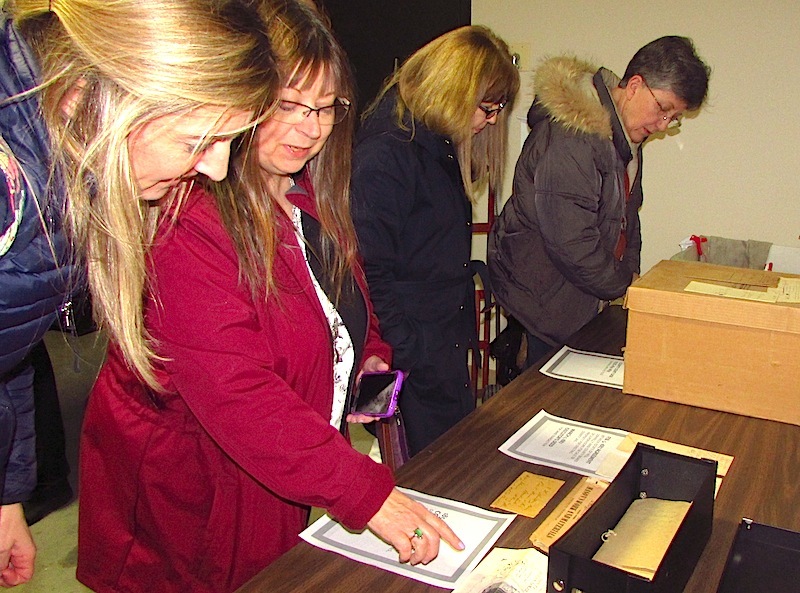 Following the tour, Joint Council members adjourned to the nearby Hartland Township meeting room to discuss upcoming events and approve new bylaws governing the group. Current members inclue the: Algonquin Historic Preservation Commission, Crystal Lake HIstorical Society, Greater Harvard Area Historical Society, Historical Society of Island Lake, Huntley Historical Society, Huntley Historic Preservation Commission, Lake in the Hills Historical Society, McHenry Area Historical Society, McHenry County Civil War Roundtable, McHenry County Historical Society & Museum, McHenry County Historical Society - Historic Sites Committee, Stickney House Foundation and Village of Spring Grove. WE INVITE OTHERS TO JOIN US! 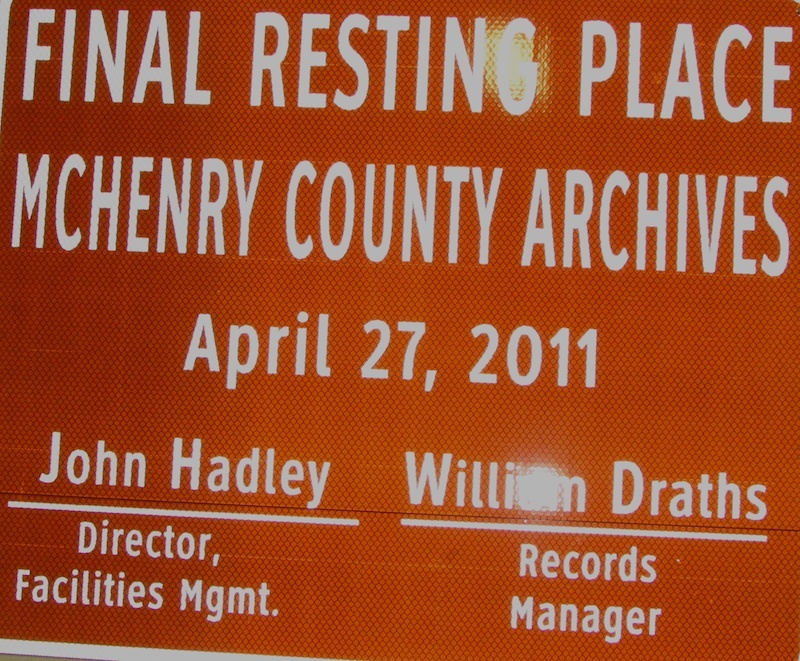 For information, email kurt@mchenrycountyhistory.org. The Joint Council coordinator/chairperson is traditionally the administrator of the McHenry County Historical Society & Museum, but may be changed as necessary. Co-coordinators may be assigned to chair committees or special projects. Committees may be formed as necessary. Membership is open to McHenry County museums, archives, historical societies and groups whose mission includes historic preservation. Like organizations along the border, whose boundaries extend into McHenry County, also are eligible. Members will sign a membership commitment form, pledging ongoing participation. It is important that member organizations send at least one representative to meetings regularly in order to foster relationships and share expertise. Member organizations must send a representative to at least one meeting per calendar year to be considered a member in good standing. If a member organization is unable to fulfill the attendance requirement, they may be dropped from membership. There are no annual dues. Members may incur costs for hosting meetings, photocopying materials, staff time, or paying a fee for a special program or speaker. Meetings are twice a year in March and September, generally on the fourth Wednesday of the month. Future meeting dates and places are announced at each meeting. At least one workshop addressing an issue of mutual interest also will be held each year, as well as periodic trips to historically interesting structures or sites. Meetings typically will begin at 7 p.m. and run about two hours. General meetings are in a roundtable format with a sharing of ideas and experiences. Workshop meetings are focused on a specific topic which may include hands-on demonstrations or a guest speaker, may require members to a pay a small fee to cover costs, and may include a tour of the host site. Member organizations may be asked to host meetings. The host site is responsible for setting up a meeting room, providing light refreshments, sending a meeting notice with directions on how to get there and arranging a tour of the facility. A programming committee may be asked to assist the coordinator and host organizations with this process. Any publication, or public stance in support of preservation in the form of such things as participation at meetings, resolutions or press releases/letters to the editor regarding any issue on which a member organization has recorded a minority opinion, must include reference to and a complete statement of that minority opinion. The passing of the bylaws or amendments to the bylaws requires the approval of a simple majority of member organizations in attendance at the meeting. Amendments will be sent in advance to members for review. Each member organization has one vote, and must be present to vote. Bylaws and amendments go into effect immediately upon approval.